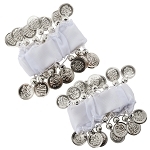 This high-quality white and silver set is a great starter Belly Dance costume. It's also the perfect one-stop solution for Halloween or any costume party! Set includes chiffon bra with pads and a multi-layered chiffon skirt with privacy panel. I live in Australia and ordered this costume for my hens nights. It was shipped immediately and reached me within a couple of weeks. I was so happy when it came. It was money well spent. Cant wait to wear it this saturday!! I buy from Belly Dance.com a lot. I have never been dissatisfied on any of my orders. They are fast on their deliveries. I do have an issue with most of the belly dance companies selling tops that no one (unless you are very tiny)could wear....This is an example of one of those. But, the price for the two piece set is good even if the top doesnt fit. The skirt in itself is such a pretty skirt....very wispy and flowing....And, it has a built in hip/coin scarf, which was really nice. I make my own bra tops anyway. I give it 5 stars!